Oats do not commonly cause bloating in most healthy adults. 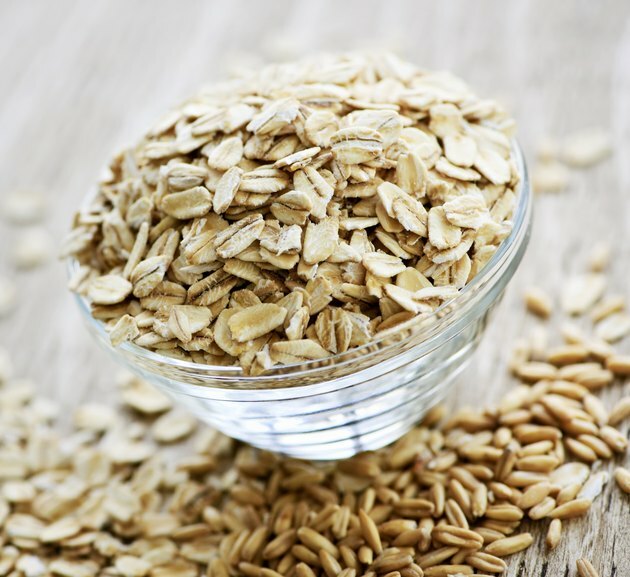 If you notice that you develop bloating almost every time you eat oats, you need to make an appointment with your doctor to determine the cause of the bloating. Oats may contain gluten, a common allergen found in wheat, barley and rye that cause adverse reactions in the digestive system if you have celiac disease, oat allergy or are intolerant of proteins found in oats. Your doctor will provide a clinical diagnosis for your condition and effective treatment options. Oats are rich in fiber and may cause bloating if you don't eat a lot of fiber on a daily basis. MedlinePlus indicates that increasing your fiber daily intake suddenly may cause stomach pain, bloating, gas and abdominal cramping. If you develop these symptoms, reduce the amount of oats you eat daily and slowly increase the amount of fiber in your diet. This will provide the bacteria in your gut to slowly adjust to the increased amount of fiber in your digestive system. Celiac disease is a chronic digestive condition that can cause bloating after eating oats. According to Jackson Siegelbaum Gastroenterology, oats were thought to contain gluten, but it has become clear that oats are gluten-free. Most oats are processed on shared machinery that also processes gluten-containing grains. Oats grown in fields near wheat may also be cross-contaminated. If you have celiac disease, you need to make sure that you eat only oats that are certified gluten-free. Eating a small amount of gluten can trigger a harmful reaction of the immune system that destroys the lining of the stomach and intestines. If you continue to eat foods that contain gluten, you can develop long-term health complications, such as malnourishment, according to the National Digestive Diseases Information Clearinghouse. An oat allergy is reaction of the immune system that treats the proteins found in oats as an antigen. The immune system reacts to the oat proteins as if they are a threat to the body and fights them off by releasing various chemicals. Immunoglobulin E antibodies and histamine released into the blood stream can cause inflammation in your digestive system, causing gas, pain and bloating. An oat allergy can cause a severe allergic reaction, which means that you need to avoid all foods that contain oats. Oat intolerance is the inability to digest the proteins in oats. Unlike an allergic reaction, the symptoms of bloating, gas and stomach pain are the result not of an immune system reaction but of a defect in the digestive system. Your body lacks the proper enzymes needed to break down the proteins and absorb them into your bloodstream.